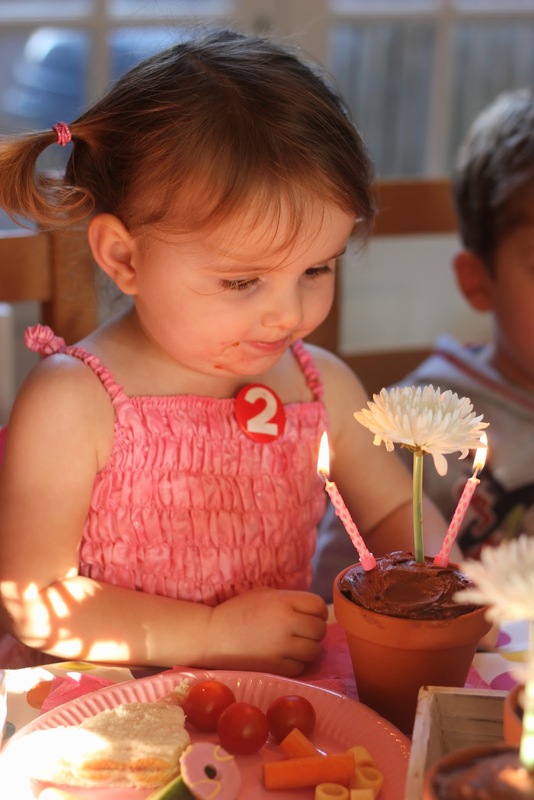 Little Pop was 2 this week and we celebrated with a garden flowers birthday party in the glorious March sunshine with all our friends! Perfect! We took a trip to the local garden centre to gather our supplies, including various terracotta plant pots, packets of seeds, bags of soil and some flowers! 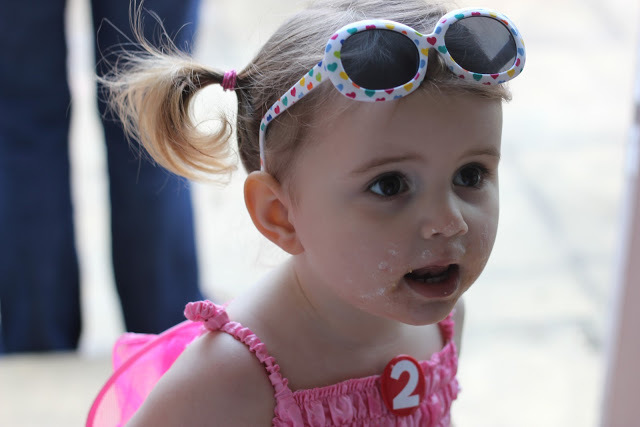 The birthday girl donned her shades and fairy dress and got ready for some serious outdoor fun! 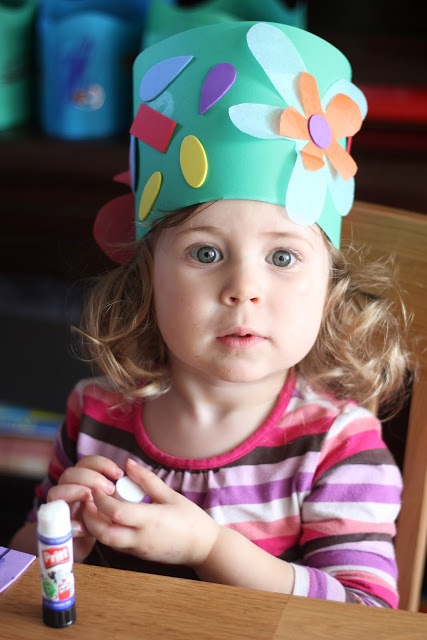 First of all there were flower party crowns to make! I cut some simple flower shapes from coloured tissue paper and they simply stuck them to their card strips and added sticky foam shapes for details. Here is the lovely Pipsqueak from Red Ted Art wearing her beautiful garden crown! 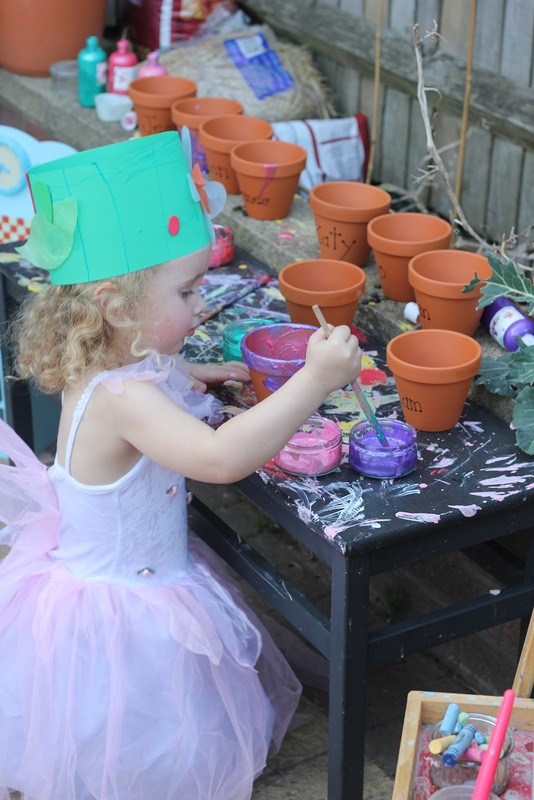 Then there were large terracotta plant pots to paint in the garden using pearlised paints. 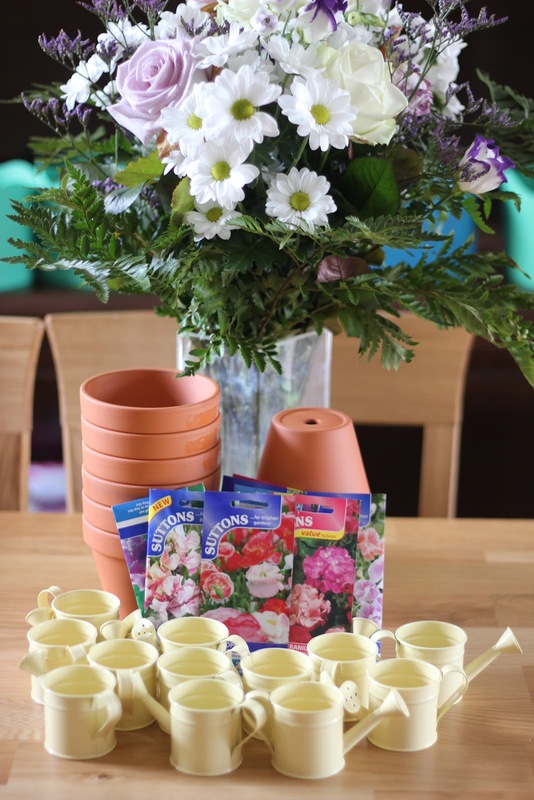 Each pot had a child’s name written on (using a porcelain paint pen) and formed the main take home gift once planted! Some more industrious painting and decorating going on! 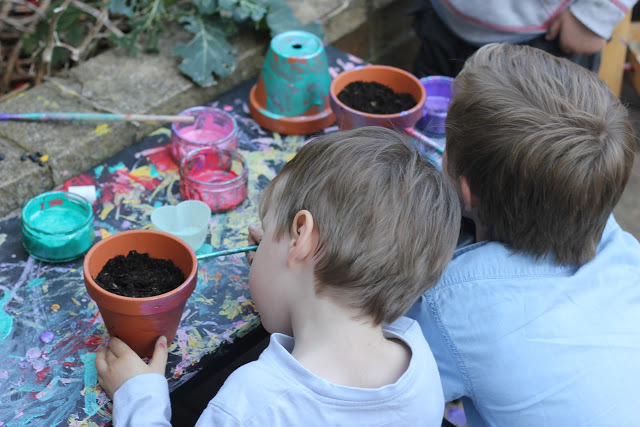 They then made some holes with their fingers and dropped in 4-5 round Sweet Pea seeds, ready for growing at home before planting out in the garden! There were mini watering cans to water them with too. 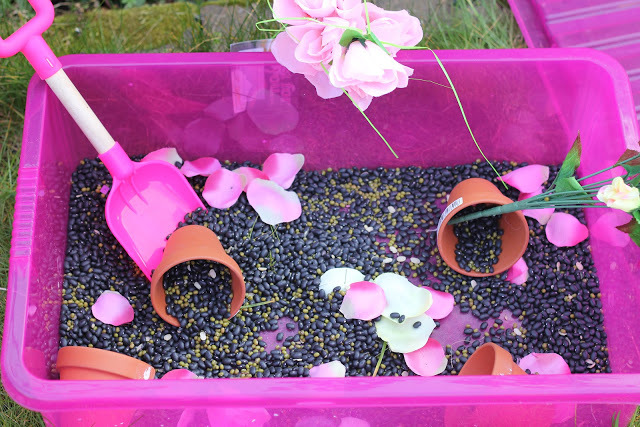 For the younger ones there was a sensory tub filled with black beans and mung beans, mini terracotta pots, fabric flowers and petals and mini trowels for digging. 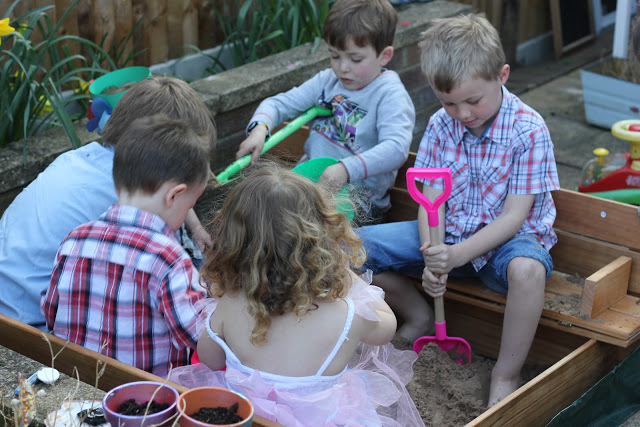 Daddy spent the entire morning constructing an awesome new wooden sand pit with fold back benches that was Pop’s main present, and finished it just in time for everyone to crowd in and play! 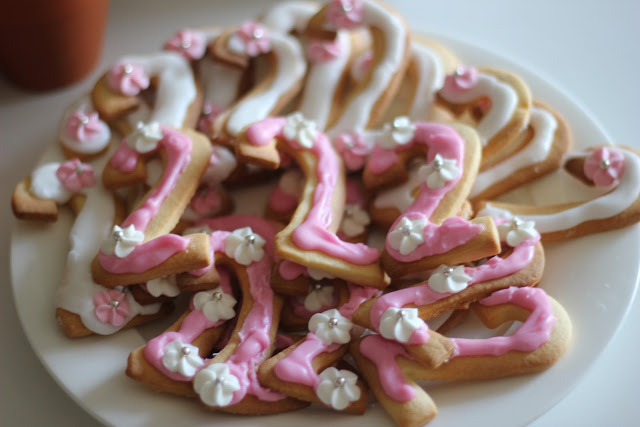 At tea time there were some gorgeous number 2 cookies made by my very generous and talented friend Yasmin, decorated with pretty flowers to match the theme! Chocolate and Carnation flower cupcakes! Birthday girl is still working on her blowing-out-skills but seemed to love her cake and candles and all that wonderful fuss that was made over her! Birthday girl with her cake! 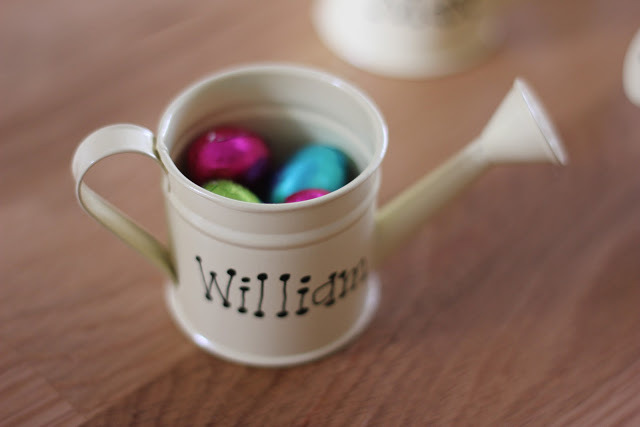 When it was time to go home there were mini watering cans with names filled with chocolate eggs as well as the decorated plant pots with their little seeds all ready to grow. It was plenty of good fun and I’m extremely grateful to my great friends Tineke, Katy, Naomi, Yaz and Maggy (the fabulous Red Ted Art!) for all their help, not to mention Grandma too of course. There’s no way I could have done a party at this stage of our busy lives otherwise! Thanks ladies! Really cute and I love how involved the children were! 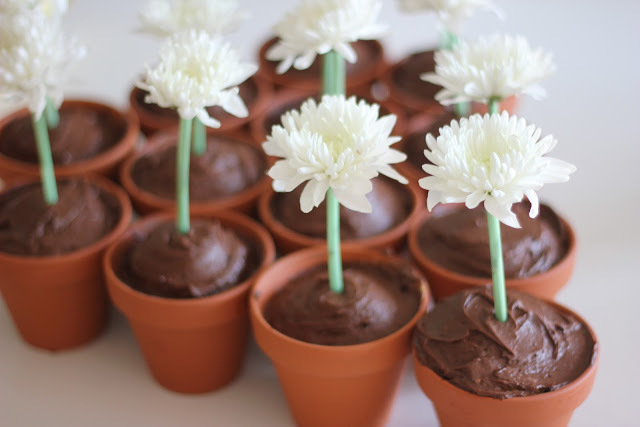 A beautiful celebration…your projects, your planting, the cookies, and your sweet little flower cupcakes. Lovely! How sweet! Happy birthday to Pop! That’s exactly the kind of sandbox we want to make (erm, hire someone else to make) for our girls. Would your dear hubby be willing to share the plans? How fun! I love the sand box your hubs built with the fold back benches! Love this: you are full of great ideas. I don;t know how you do it with a newborn. A|nd how the girls have grown since I last saw them!! Anna, that is so cute! I want my next baby to be a girl so bad so I can do these sorts of cute things! Adorable party – I love all of it! Do u actually cook the cakes in the terracotta pots?! Such a lovely party and a great theme as well. Love it! Those cupcakes are awesome!!!! Wow, this is soooo wonderful. I absolutely love it!!! Happy birthday little Pop!!! What a beautiful party. Perfect for spring! Love the tiny watering cans, the cupcakes and al the other ideas! What a splendid party – great that you had the sunshine. Am in bewildered awe at your ability to organise such a thing with a newborn baby. 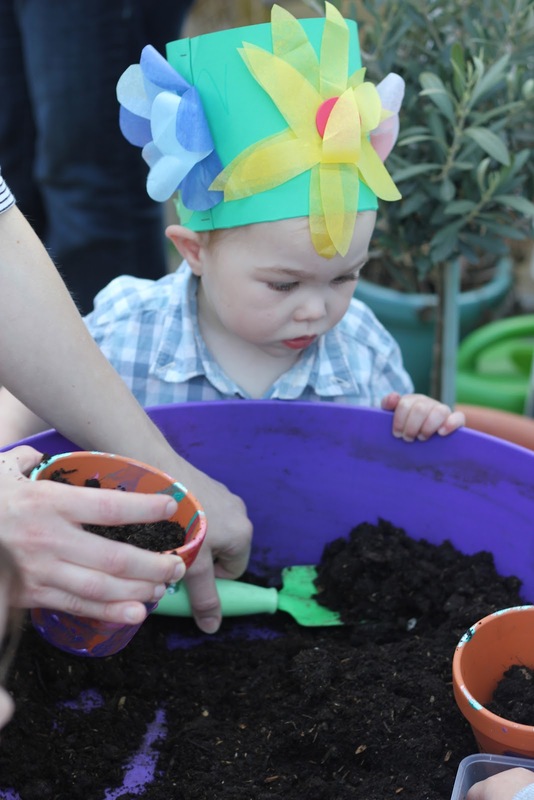 We had a party a month ago – a very different theme for an older child. But here’s the link just in case you’d like to see what we did! Oh my, crafty crafty mommy! 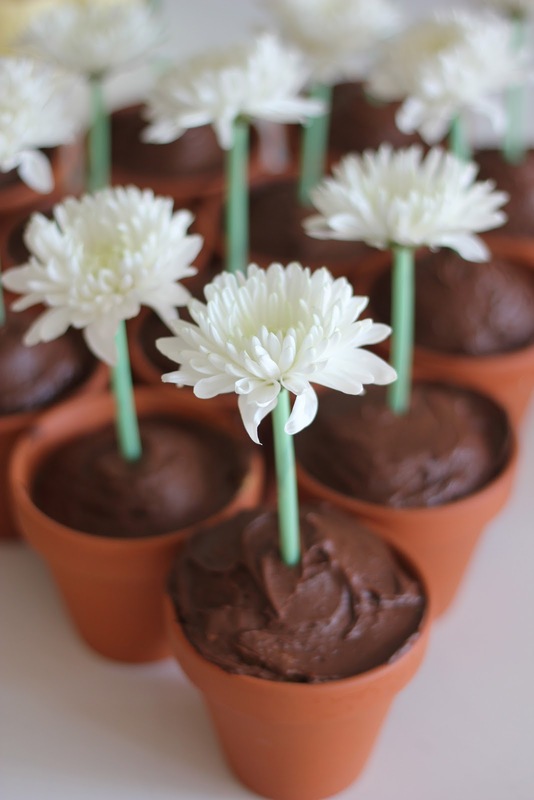 And that’s a new take on cupcakes, flower pots that are simple yet lovely! I’m sure the kids had a lot of fun! How wonderful for spring! And everything looks so wonderfully perfect. 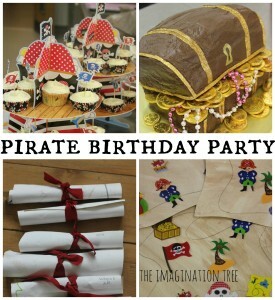 I wish someone would throw me a party like that :0) Truly wonderful idea the younger ones would really enjoy that tactile experience all the textures, colours etc. Looks like an outstanding party for little ones. Thanks for the great ideas and the wonderful pictures. What an adorable little girl you have. Gorgeous. I am planning a fairy 5th birthday party with fairy gardens as the take home gift. Thanks for some inspiration! What a wonderful party!! 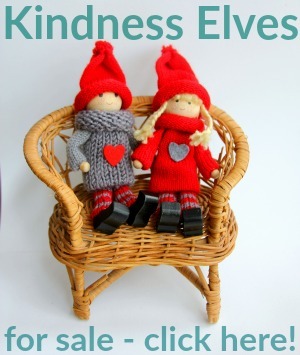 I would love to invite you to share at our new linky party for family times at http://craftymomsshare.blogspot.com/2012/03/happy-family-times-new-weekly-link.html. Thank you!! Such an adorable birthday party! I wish my daughter’s birthday was in Spring so I could throw her a party like this vs in the fall! Thank you so much for this great site! I joined your site. I preschool teacher. I have a blog related to the pre-school activities. If you visit will be very happy. 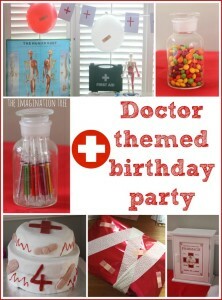 I was thrilled to find such a delightful post about a terrific birthday party theme and your approach to incorporating it is multi-dimensional, fun, and creative! The colorful photos are a great visual to showcase the activities you included, which are just fab. 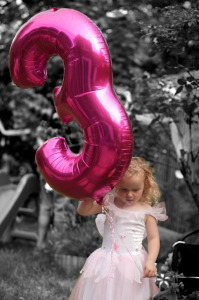 When you can incorporate such fun things for the children to do, it can make the day more memorable. 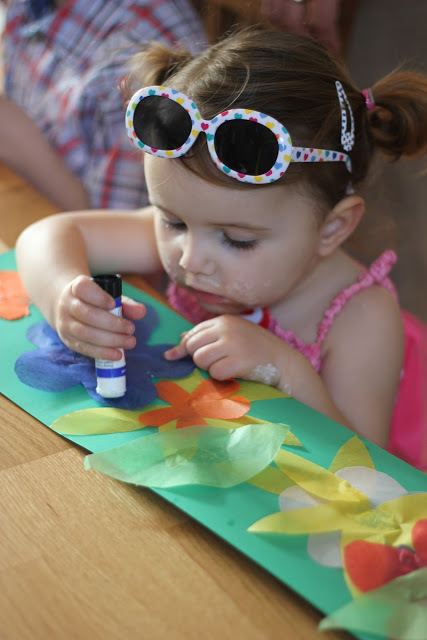 I encourage folks to consider the possibility of using the creation of a family-tradition based visual I call a Birthday Wall for a craft activity, especially for younger ones who enjoy getting their hands busy! 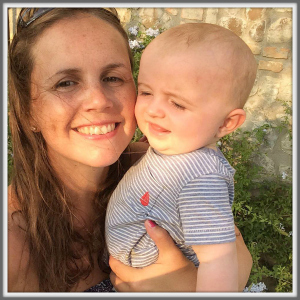 My e-book, The Birthday Wall: Create a Collage to Celebrate Your Child, is a how-to on creating a colorful visual to show appreciation for who your child is right now. 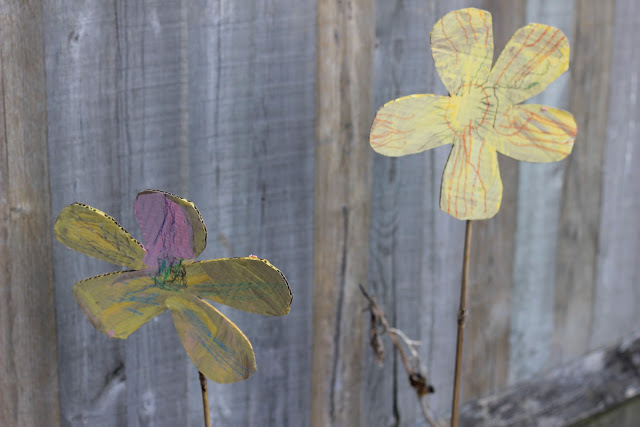 I will link your post, A Garden Flowers Birthday Party, to The Birthday Wall blog, for other parents to be inspired by this lovely theme you incorporated into your daughter’s birthday party. Thanks for sharing an inside view of your delightful flower theme. It was great idea! 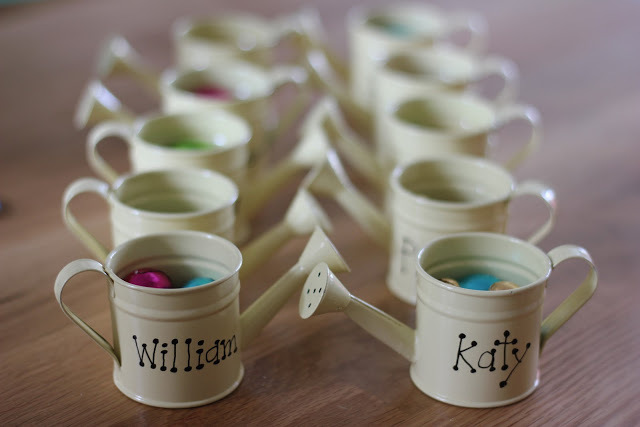 Birthday girl is looking so cute, Really Fantastic idea specially like this- mini watering cans with names filled with chocolate eggs, too good thanks for sharing such a wonderful birthday party. 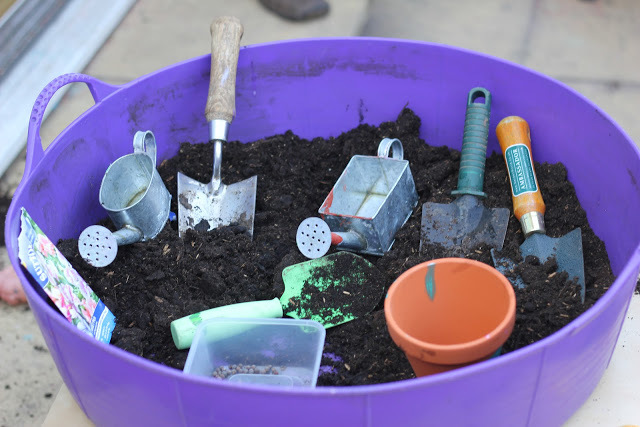 where did you find the watering cans?